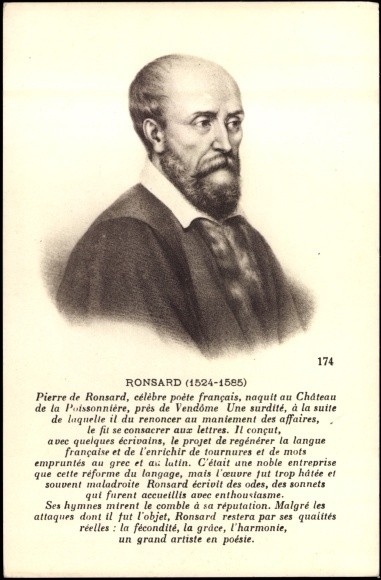 This is another of Ronsard’s poems to be recited by two singers, alternately; or rather, as he specifies, two ‘players of the lyre’. Le Ciel et l’autre la France. Des beaux rayons de sa teste. La terre, le ciel et l’onde. Et la paix en sa contrée. Du Soleil prendre la place. The Heavens, and the other France. Gives light to the earth. And peace in his country. To take the Sun’s place. « La Trophée d’Amour », the Trophy (or monument) of Love, is dedicated “à la Comedie de Fontaine-bleau” (‘to the Comedy [Theatre] at Fontainebleau’). It’s a light-hearted portrait of Cupid. Dont fut basti ceste machine ronde. Et les mortels heritiers sur la terre. Et le harnois ne defend les gend’armes. Et de leurs cœurs j’enrichis mon trofée. Et que mon feu n’embrase la marine. Et sans viser je frappe à l’imporveüe. Et bref je suis de toute chose maistre. Et seulement à moi seul je ressemble. By whom this round engine [the world] was built. And the mortals who’ve inherited the earth. Nor can armour defend the man-at-arms. With my fire every soul is warmed. And with their hearts I enrich my monument. And my fire from burning the sea. And in brief I am master of all. And I resemble only myself. Et de leurs cœurs je bastis mon trofée. And from their hearts I build my monument. and a couple of stanzas from the end he has the line “Foible et puissant, superbe et gracieux”, which has a subtly different weight.